According to Mayo Clinic , in order to lose weight, one must not exceed their daily calorie intake.Weight loss happens when you burn more calories than you take in your body. But between work, family obligations, and errands, recording what you eat can seem like a far-fetched goal. Keeping track of your weight loss and calories has just became easier with the app Myfitnesspal. Myfitnesspal is completely free! You won’t have to worry about your weight loss plan hurting your pocket. Even after weeks or months of use, Myfitnesspal will not charge you for using the app. With any weight loss goal, support from friends and family increases your chances of success. MyFitnessPal acts as a social media site as well since you are able to add friends and family to view your profile. When you input your weekly weight, your followers will receive a notification of how much weight you lost and you are able to write comments of encouragement. If you want to return the favor, you can view the profile of friends and family and cheer them on their weight loss journey! MyfitnessPal has you enter your height, age, and weight to give you the recommended amount of calories you should consume to either gain, stay , or lose weight. The app also asks how many pounds you want to lose per week and will give you a calendar of how long it will take you to reach your final goal. Since health is a concern , Myfitnesspal sets realistic weight loss goals. At the end of the day, the app will tell you how long it will take you to reach your goals if you were to repeat the same tracking and calorie intake pattern everyday. The app has a searchable database of over 4,284,000 items and the list is still growing. 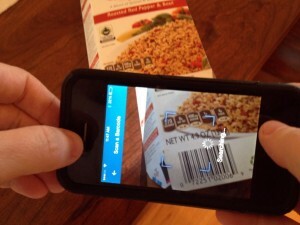 A convenient tool, the bar-code scanner on the app, allows users to quickly track calories of food items without manually searching. Your favorite restaurants and foods are easy to find right at your finger tips. You can either search for your food item or scan it with the bar-code scanner on the app. MyFitnessPal allows you to record and track your cardiovascular activities so you can receive more calories to use on food. The list of cardiovascular activity is endless and runs from zumba, swimming, jogging, biking, and karate. You are able to increase your food intake and still lose weight based on how many calories you burn during your weekly activities. Bar graphs are computed for the user to view their weekly calories intake. Graphs also track monthly weight loss so users can have a visual representation of their long term goals. 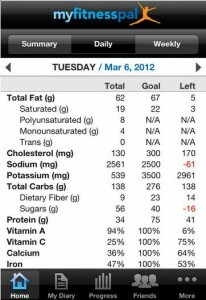 Everyday, the app has the recommended amount of carbohydrates, protein, sugar, fat, fiber, and vitamins you should consume so you can make sure you are losing weight while receiving all the recommended nutrients! 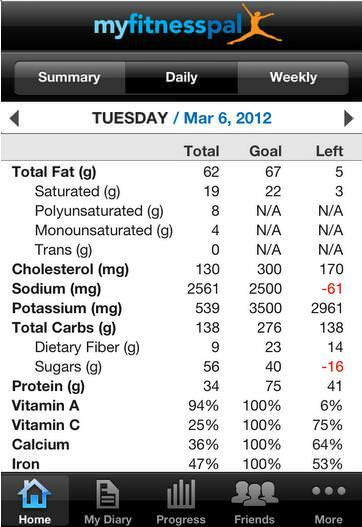 An example of the nutrient tracking section on the phone application. Myfitnesspal has all the tools for you to reach your weight loss goals. The work needed from you is to track all your food intake and stay within the recommended calorie amount. If you need tips on your weight loss journey, check out articles from our CareClub News Weight Loss section.